All-electric satellites are changing the way airline passengers access the internet. Like a Tesla in space, an all-electric satellite uses electric propulsion to climb from transfer orbit to geostationary orbit and to maintain its position on station, instead of the chemical rockets used by traditional satellites. Such satellites still need a traditional launcher burning solid or liquid fuel for the brute-force task of getting them into space, but the delicate work of positioning the satellite is done electrically. Without the need to carry vast quantities of chemical fuel, all-electric satellites can be up to 40 percent lighter at launch. That gives their operators the option of using a smaller, cheaper launch vehicle -- or of tacking on extra communications equipment to deliver more power or operate in more frequency bands. Whatever option the operator chooses, airline passengers jonesing for in-flight internet access benefit, as the service can be cheaper, faster, or available in more places. Boeing has been building all-electric satellites for a couple of years, but now a European company, Airbus Defense and Space, is getting in on the game. The first Airbus-built all-electric satellite, Eutelsat 172B, is scheduled for launch late on June 1. 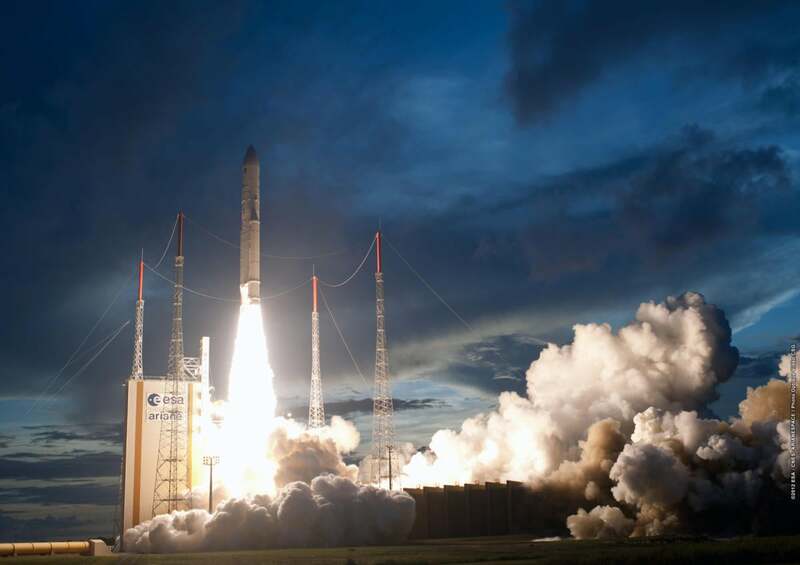 It will take off from Kourou in French Guiana aboard an Ariane 5 launch vehicle. The same launcher will also carry ViaSat 2, a conventionally powered broadband communications satellite built by Boeing. Once lofted into its transfer orbit by the Ariane 5, Eutelsat 172B will turn on its electric motors and start the slow climb to geostationary orbit over Asia. ViaSat 2, meanwhile, will light up its rockets for a somewhat faster journey to an orbital slot over the Americas. While Eutelsat 172B carries no combustible fuel, it does still carry some expendable reaction mass -- something to sling out the back in order to push itself forward through the vacuum of space. It will use xenon gas, splitting it into positive and negative ions and accelerating these to high speeds using an electric field. The use of xenon ion propulsion systems (XIPS, pronounced "zips") to move a satellite up into geostationary orbit is relatively new. Most still use chemical thrusters ejecting burning gases for that task, although there are plenty of satellites using XIPS to remain on station. The electric propulsion system draws its power from the satellite's solar panels but, even if the satellite still has power, once its xenon reaction mass is used up it will slowly drift off station and it will be time to launch a replacement. So what does all this mean for airline passengers? Lots more internet capacity, for one thing. One of the three communications packages Eutelsat 172B will carry is the high-throughput service that will be operated by Panasonic Avionics. That company will its 11 spot beams with a capacity of 1.8Gbps to deliver in-flight entertainment and connectivity to commercial airlines across the Pacific Ocean. The satellite's manufacturer, Airbus, is also building other all-electric satellites that will be able to carry even bigger communications packages, promising still more bandwidth to come. Peter Sayer covers enterprise applications for CIO.com.